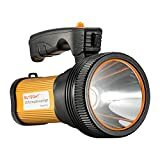 If you think that a spotlight is just like a regular flashlight—or even that it’s a regular flashlight, only a bit bigger—then you might not understand why it would be helpful to buy one. After all, light is light. 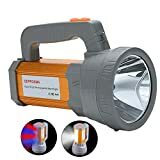 However, a spotlight would be better described as a super-powered flashlight: its beam far exceeds that of a regular flashlight, and depending on how much the beam is focused, it can also illuminate a much wider area. A spotlight can be an excellent tool. You can find spotlights that are especially for hunting--and some companies have special attachments and colored lenses. Then there are spotlights for camping--handheld lanterns that can be propped up, to illuminate one area. There are other solar-powered spotlights that are useful for illuminating a yard or garden. And finally, you can find spotlights that you attach to a vehicle: an SUV, truck, car, or boat. They light up the road ahead of you a lot more efficiently than just a pair of headlights. Battery-powered: Traditionally, portable spotlights require a number of batteries for illumination. There are still many battery-powered spotlights in the market, although today they tend to be more energy efficient. Rechargeable: Rechargeable spotlights don’t rely on batteries; instead, they are powered by power sources and can be plugged in and charged, like rechargeable power tools.An example is the Stanley SL10LEDS 10 Watt Li-Ion LED Spotlight, which has an internal Lithium-Ion battery. But devices that use rechargeable batteries that are "special" for the device have a significant risk: once the battery or the charger fails, the device becomes unusable. Therefore, a device which takes rechargeable batteries in the standard sizes (“C”, “D”, etc.) is ideal--when the batteries don’t charge up anymore, you can just purchase new ones. A good example of this is the Kazoku High Power LED Rechargeable Spotlight, which takes 4 “AA” batteries. Solar-powered: Many spotlights for lighting up a yard or garden use solar-powered LEDs. They have a solar cell that charges up a rechargeable battery during the day and emits light during the night (or even during the day, if the ambient light is low). Besides saving electricity, they also save you the effort of installing complicated wiring in your yard to string up a series of lights in order to illuminate it adequately. Halogen: This is the more traditional choice. A halogen lamp contains a filament, much like a typical incandescent bulb. But the bulb also contains a halogen gas, such as iodine and bromine. There is a chemical reaction between the tungsten filament and the halogen gas, known as the halogen cycle--a reversible chemical reaction, where the tungsten evaporates, combines with the halogen and is redeposited onto the filament. This requires that the light bulb gets extremely hot--at least 250 degrees Celsius (a regular incandescent lamp is around 130 degrees Celsius), which in practice is more like 540 degrees Celsius. Since these spotlights will be very hot, they will be used more in stationary spotlights, than in the hand-held flashlight-type models. Hunting: There are spotlights that you can attach to a rifle, or just to use to illuminate a wide field when hunting. They also employ red or green lenses. (Red lenses are used for hunting coyotes since the red light doesn’t scare the animal away. Green lenses are preferred for hunting wild boar--the green light is best for illuminating a dark-colored boar.) Filtering the light through a colored filter will also keep the light from reflecting off of you--that will help you remain inconspicuous. 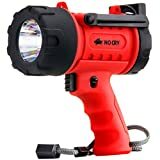 The Sirius 500 Lumen Handheld Spotlight has a detachable red lens (even though the light doesn’t attach to a rifle). Also, a hunting light has to be especially bright, since you want it to illuminate through thick foliage. Camping: Most handheld spotlights are for camping and hiking so that you can see what is around you when you’re outdoors. Gardening: There are a number of spotlights that you insert in the ground, to help illuminate either your plants or the walkway in your garden. 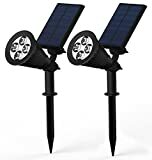 The Newhouse Lighting Solarspot High Powered LED Metal Solar Spotlight is mounted on a spike, for extra convenience when positioning it in your yard. Vehicles: There are spotlights for boating or other recreational vehicles. For example, the MicTuning MIC-5DP50 are a set of LEDs that you attach to the front of your jeep, SUV, truck, car or other vehicles. Light distance: Since people usually use their spotlights outdoors and in areas without a lot of artificial light, it makes sense that they want spotlights that can light up large areas. The best models do just that. Reliability: The last thing a spotlight or flashlight owner wants to happen is for their light to go out, especially when walking in the dark outside or fixing a car in a garage. Great spotlights don’t do that. While no model lasts forever, good ones do last long enough to provide their owners years of reliable lighting. Charge speed and hold: One of the most important factors of consideration for reviewers who purchased rechargeable spotlights is the recharging process. The best models are ones that can be recharged quickly—no need to wait for hours on end for the light to charge—and they hold a charge, even after hours of use. For example, once you charge up the Stanley SL10LEDS 10 Watt Li-Ion LED Spotlight, it can stay charged for as long as 12 months at a time. 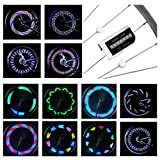 You can keep it on continuously, and it will still provide illumination for 7 consecutive hours. Pistol-style pushbutton: Many models of handheld spotlights use the pistol-style pushbutton design: With the Stanley SL10LEDS 10 Watt Li-Ion LED Spotlight, for example, pulling the trigger once will give you “high” mode, pulling a second time within 5 seconds will give you the “low” mode, and a third time will turn the spotlight off. The Browning Spotlights are also a “pistol style” spotlight, but they also have a “strobe” mode, as well as a “lock” button, to keep the spotlight on one mode. Power: The most important specification that you can find in a spotlight’s product description is perhaps its power. 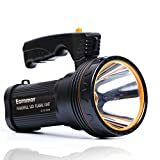 Look out for terms like “candlepower” or “lumens”, both of which describe how much light the device will give out, and pick a model that has a high number relative to its competitors. The candela is the illumination of emitted by a light source in one particular direction, with one candela being the equivalent of 1 candle's light. Lumens are the unit of light emitted in a particular solid angle of volume. So the conversion rate is 1 candela = 4𝜋 lumens = 12.57 lumens per degree of the angle over which the light is emitted. One of the brightest commercial spotlights, the Sunforce HID (= high-intensity discharge) spotlight lantern, boasts of being able to produce 40 million candles of light! Wide-beam versus long-distance: Spotlights usually can be focused into a small angle, which means that the beam goes a longer distance. Or you can illuminate a wide angle, but at a considerably shorter distance. The Streamlight 44900 Waypoint Spotlight has a wide beam mode and a long-distance mode. In its wide beam mode, it emits 7900 candelas over a distance of 178 meters, which in long-distance mode, it emits a beam of 100000 candelas over a distance of 625 meters. Size: Spotlights come in a variety of shapes and sizes; the larger ones can be a bit unwieldy, depending on who is using them and how they are used. Think about how you plan on using your spotlight: if you intend to carry it around with you as you walk in the woods, maybe a smaller and more portable model will be in your best interests. Support: Some spotlights are exclusively hand-held, while others come with support, such as plastic legs. Again, think about how you plan on using your spotlight. For instance, if you plan on using it to light up your garage while you work on your car, you’ll definitely want a model that can support itself, thus allowing you to have both hands free while you work. Waterproofing: This is another quality that is more important for some users than for others. If you plan on using your spotlight outdoors, be sure to pick a model that can weather the elements. The Browning High Noon 4C Light is not only waterproof--it even floats in water! That makes it easier to retrieve, in the event that it falls into a body of water. Light bulb lifetime: LED lights can last a long time. But it’s good to compare the lifetime of the bulbs on your spotlight. As an example, the LEDs on the Kazoku High Power LED Rechargeable Spotlight have a lifetime of 50,000 hours of use. Streamlight: Streamlight, founded in 1973, is an American manufacturer of flashlights, spotlights, and other lighting devices. It manufactures a wide assortment of lighting products for different uses, including industrial use, law enforcement, and home lighting needs. Their headquarters is located in Eagleville, Pennsylvania. Black & Decker: Black & Decker is one of the most highly-respected tool manufacturers in the world. Founded in 1910, the company now produces tools for virtually every job and every worker. Stanley: Stanley Tools is another company that has been around for years, earning a reputation for high-quality products. 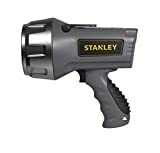 Founded in 1843 as a hand tool company, Stanley has stayed true to its original vision while adding a wide range of power tools, lights, and other devices for everyone from professionals to home handymen and handywomen. GSM Outdoors: GSM Outdoors is an American company that manufactures products specifically designed for outdoor enthusiasts. Founded in 2000, the company makes a range of products for people who are interested in hunting, fishing, or simply communing with nature by getting out into it. Cyclops: A division of GSM Outdoors, Cyclops also produces lighting and other accessories (including portable chargers) for people on the go.